Based around the Cisco Routing and Switching technology track, this Pro Pack covers a range of Cisco approved certification courses starting from the Cisco Certified Entry Network Technician (CCENT) and progressing onto the Cisco Certified Network Associate (CCNA). Whether you’re looking to begin a career in Cisco networking and gain your first certification or want to upgrade your Cisco certifications, this Pro Pack with exams included is ideal. 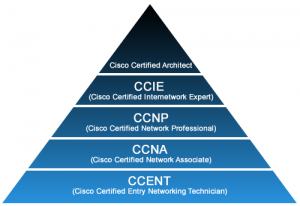 Once you have completed each course and passed the mock tests, you have the option to sit an official Cisco exam for each course and get certified. The exam fee for each course is already paid for as part of this pro pack. To book your exam date, email [email protected] with your preferred date and time. We will usually reply to you within 24 hours (during business hours: Mon-Fri 9:30am-6pm GMT) to advise you whether your time slot has been approved. If approved, you will receive a second email with further instructions. We ask that you give us at least seven days notice to book your exam slot. We recommend you take one exam after completing each course, rather than attempting to take all the exams after completion of the entire course. On the day of your exam, you will be required to attend a test centre .